This qualification will benefit experienced pharmacy assistants who are looking to expand their skills in the area of dispensary. Dispensary assistants work with the pharmacist to provide prescription medicines to pharmacy customers. Under the supervision of the pharmacist, dispensary assistants maintain customer records, select and label medicines and process claims. Accredited training can help you develop management skills and provide specialised support in the pharmacy, while granting you formal recognition of your existing skills. The Certificate IV in Community Pharmacy Dispensary is a flexible course that can be tailored to meet your learning requirements and career goals. We will work with you to develop a training plan to meet your needs and the needs of your pharmacy. Most dispensary learners complete this qualification in around 12 months. There are no entry requirements to complete this qualification. However students need to be employed within a community pharmacy and working a minimum of 13 hours per week for the duration of the course and have sound English and numerical skills. This course is delivered via workbook and completed whilst working in a community pharmacy. Support and assessment is provided by a qualified Guild trainer throughout the course duration. This qualification provides you with the next step in your career in community pharmacy. 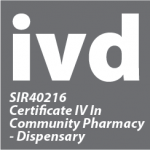 Community Pharmacy Dispensary expands on the skills that you have learnt if you have completed a Dispensary Assistants Course or dispensary units at the Certificate III level. This qualification is nationally recognised in all states and territories of Australia. 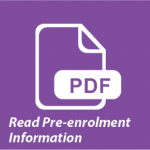 Course fees are determined based on a student’s eligibility for ‘Skills First’ funding (Victorian government subsidised training). Students who are ineligible for the Skills First funding are charged at Fee for Service rates. This course fee is GST free, inclusive of administration fees and provides for electronic workbooks. The fees stated are indicative and subject to confirmation during enrolment based on eligibility for funding and credit transfers. Additional material fees apply if hardcopy workbooks are requested ($15 per workbook). Member prices apply to employees of the nominated Guild member pharmacy. AFSPA prices apply to employees of the AFSPA pharmacies. * denotes the Standard Tuition Fee and is subject to change given individual circumstances at enrolment. Guild Training will be able to assist in determining your eligibility for funding. Guild Training encourages people with disabilities to access government funded subsidised training. 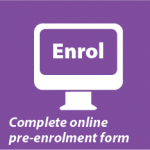 You will be contacted by a Guild Training team member after completing and submitting the online pre-enrolment form.